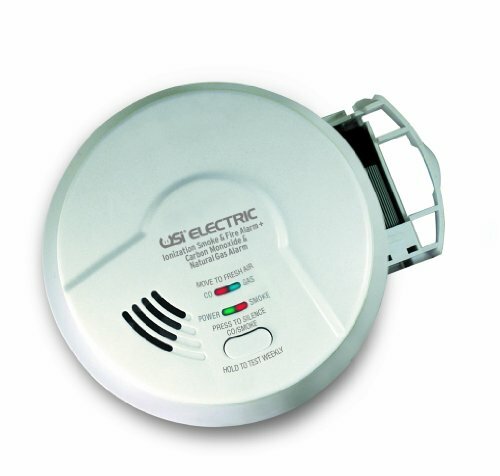 The USI Electric MICN109 Hardwired Ionization, Carbon Monoxide and Natural Gas Alarm is a 3-in-1 device that provides protection against three deadly household threats: fast-flaming fires, carbon monoxide and natural gas (or methane) in a single installation. Perfect for new or replacement installations, the 120-volt AC/DC hardwired alarm is suitable for houses, apartments and mobile homes. Advanced smoke recognition gives the MICN109 a faster response to smoldering fires than conventional smoke alarms. Auto sensitivity calibration provides superior nuisance alarm protection and creates consistency in alarm sensitivity. This alarm has additional automatic features including a self-diagnostics check and a sensitivity adjustment for changes in temperature or humidity. The 9-volt alkaline battery (included) continues protection in the event of a power outage. This alarm features a front-loading battery drawer for replacement without removing the alarm from the bracket. Mount the bracket to any standard wiring junction box and use the large mounting base to cover imperfections in drywall. The plastic dust cover protects the alarm and (2) tamper-resistant locks prevent unwanted alarm or battery removal. For maximum protection, install an alarm inside every bedroom, outside every sleeping area and on all levels of the dwelling. Comes with a 7 year limited warranty. Two detectors were installed on our new home in July 2014, were replaced in March 2015 due to a technical malfunction. I replaced both units again in August 2016 due to constant malfunctions, and now July 2018 I am faced with another replacement.